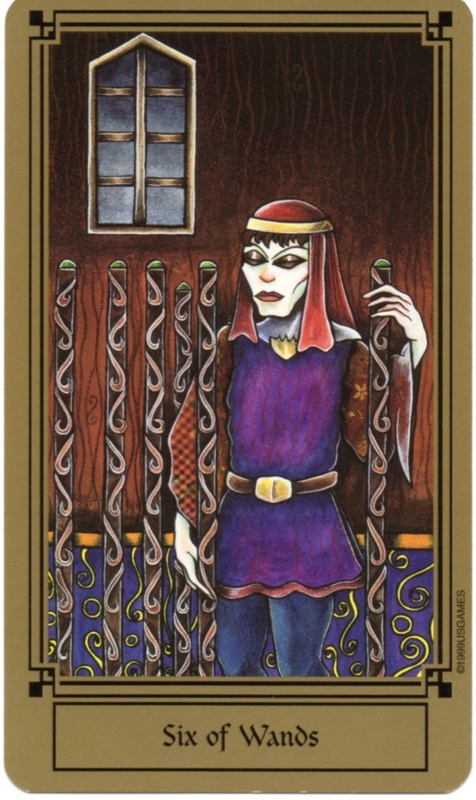 Six of Wands from the Fantastical Tarot. More wands/Fire. The Six indicates a position of victory, strength, being in command maybe. You’ve fought the battle in the Five, and come out on top. People will recognize your triumph, accolades are received. I’m hoping this means I will get deserved credit that a certain person in my office is trying to lay claim to. This is encouragement that you’ve done the right thing and others will see what you have achieved. Take credit for your accomplishments, be proud of yourself. It may not mean a huge raise, but your reputation should be solid and your word respected. Don’t doubt yourself. Sounds good! Hoping this will come to be. But if that other person continues to try to steal credit for your work, don’t let the truth go unknown. Thanks, Tasha. Unfortunately this girl is the office darling, the boss loves her and she gets away with murder. I’ve been on the lookout for a new job for a long time. Ah. That stinks, to put it mildly. But you keep your head up high. You know what you did, and I bet others there know, too. And appreciate your work, even if they’re not in the postition to reward you for it. Love the your last paragraph and this card. Agree with Tasha stomp it in the bud before it prolong itself. This way the other person don’t think of you as a doormat and can do what they like. Place your name on your work, share your ideas with other colleague in the office as well. This way when they hear the other person taking credit they know it was not their ideas but yours. Wishing you a wonderful week and your deserve credit! Oh, and I love your avatar. Haha, thanks 😉 I laugh every time I see it! Excellent post, DD! Every word of it is true! We should all be proud of our accomplishments. Even if they are accomplishments only within the boudries of our own lives.